Abstract: A central question in a criminal forensic investigation involved a hole (later termed a “defect”) observed in a garment and whether it was produced by a bullet or some other means. The individual wearing the item was known to have fired or been in the vicinity of a firearm that was discharged, rendering the presence or absence of gunshot residue on the garment irrelevant. The micromorphology and elemental composition of the severed fiber ends in a series of exemplar bullet holes were characterized to identify specific physical indicators of the bullet-garment interaction on a microscopic scale. 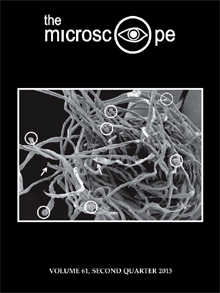 This study confirms prior research indicating that fiber failure, due to the high-energy transfer from a bullet to a synthetic fabric, is consistent with a high-speed tensile fracture mechanism, which results in characteristic fiber-end micro-morphology due to partial melting. In addition, scanning electron microscopy (SEM) imaging and elemental analyses by energy-dispersive X-ray spectroscopy (EDS) provide direct evidence of the capture of detectable microscopic lead particles both on and within the melted fiber ends, a process termed here as plumbum microraptus (microscopic lead capture). These lead particles are observed primarily as planar abrasion fragments but also as spherical particles, the latter of which further illustrates the high-energy transfer. Through the study of individual broken fibers from within a suspected bullet hole, these characteristic indicators provide a minimally invasive and direct means to definitively associate or (equally important) dissociate a fabric defect with a bullet perforation. Excerpt: Movie stars don’t have to be human to be memorable. Audiences fell in love with “E.T.,” the winsome extraterrestrial. They don’t even have to be cute; people were enthralled by the 20-foot, 2,500-pound great white shark in “Jaws” and even more by those fabulous dinosaurs in Jurassic Park. What links these is the freewheeling skill of their creator, master filmmaker Steven Spielberg. And it was Spielberg who created the most unusual film stars of all: microbes. His epic movie “War of the Worlds” features free-swimming microorganisms in the opening scenes. We zoom out from the nucleus of a ciliated microbe to find a water droplet on a leaf that is swarming with protists swimming eagerly about. It is a memorable scene. The film, released in 2005, is one of the few to show microbes as part of the story. Abstract: The amphiboles occurring in the Rainy Creek Igneous Complex (RCC) near Libby, Montana, range in composition such that the following amphibole species have been identified: tremolite, winchite, richterite, magnesioriebeckite and magnesioarfvedsonite. The composition, optical and crystallographic values of only winchite and richterite have been determined. In an attempt to characterize the nominal (i.e. mean) refractive index for tremolite, magnesioriebeckite and magnesioarfvedsonite species, derivations of Gladstone-Dale constants specific to the RCC were attempted. It was not possible to obtain specific Gladstone-Dale constants using these data for the RCC amphiboles. Therefore, the Gladstone-Dale constants derived by Jaffe for the alkali amphiboles were applied to the published electron probe microanalysis (EPMA) data from Meeker et al. specific to tremolite and magnesioriebeckite, as well as the data from Sanchez et al. for magnesioarfvedsonite. (Note: Dyar and Gunter, and references therein provide more information on amphibole nomenclature and correlations of refractive indices to mineral structures.) The range of nominal refractive indices for the tremolite, magnesioriebeckite and magnesioarfvedsonite are calculated as n=1.610 to 1.629, n=1.646 to 1.665 and n=1.641 to 1.652, respectively. The nominal range of refractive indices for the amphiboles occurring within the RCC is much smaller than the ranges for amphiboles under current International Mineralogical Association nomenclature for magnesioarfvedsonite and magnesioriebeckite and their solid solutions. Therefore, caution is required when using the optical properties of amphibole in asbestos determination at Libby. Excerpt: The poem “Microscope” by Louis Ginsberg was cut from a newspaper and pasted inside the book, The Microscope by Simon Henry Gage. Above the poem, Gage had written a presentation note to Émile M. Chamot, professor of chemical microscopy at Cornell University. I got the Collected Poems of Louis Ginsberg, which was edited by Michael Fournier (Northern Lights: Orono, ME, 1992), but noticed that the poem that was pasted into Chamot’s copy of Gage’s book did not appear in the Collected Poems. Instead, there was an epigram with the same title. Excerpt: Cyclotella jonesii McLaughlin, a new diatom from Chiloquin, Oregon. As this new diatom has just recently been validly published, notification of it in this journal may seem redundant. However, this particular diatom has special meaning to me, and to the editors and readership of The Microscope. The specific epithet has been chosen to recognize Dr. Francis T. Jones of Berkeley, California. Dr. Jones has, over the years, contributed many fine technical papers to this publication, and is well known for his expertise in optical crystallography.